Glacier National Park Superintendent Jeff Mow has selected Pete Webster to be the park’s new deputy superintendent. Webster will be responsible for leading the park’s division chiefs in identifying park priorities, addressing complex operational challenges, and long-range planning. In recent years the park has faced numerous challenges related to rising visitation, invasive species threats, and wildfires among others. 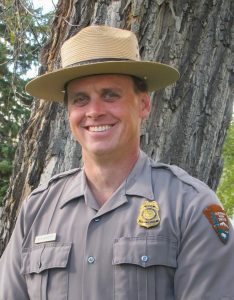 He has served as the chief ranger at Yellowstone National Park since 2015. A native of the Detroit, Michigan area, Webster holds a Bachelor of Science degree from Michigan State University. He and his wife Dawn will live in the Flathead Valley with their youngest son, who will enter high school in the fall. He replaces Eric Smith who moved to Texas last fall to serve as superintendent of Lake Meredith National Recreation Area and Alibates Flint Quarries National Monument.